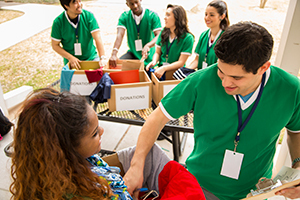 During a disaster or emergency event, it is very common for people both within the impacted community and in the surrounding areas to want to volunteer their time to assist with response efforts such as clean-up. Many who are for whatever reason unable to volunteer choose to help through donations of goods and services to aid disaster relief. Contact family, friends and neighbours in your vicinity and offer to assist them with the clean up on their properties. Pool resources with those in your vicinity, particularly when using private transport - fewer cars travelling through the affected area will ensure clear access for emergency services. Local community or religious groups may organise working bees for larger jobs and these are a great way to help the people in your immediate area. The best way to ensure you are able to assist in a coordinated agency response within the impacted area is to sign up as a volunteer with a registered agency during a time when there is not an event occurring. Disasters and emergencies can often inspire the people in surrounding areas to be generous and charitable, wanting to help those who have been affected by donating goods, services, and funds. Ipswich City Council has partnered with GIVIT to manage all offers of donated goods and services, including corporate offers of assistance, during the recovery phase of disasters. GIVIT’s unique online portal allows the public and corporate entities to see exactly what is required by communities, and enables people to pledge funds, items and services to meet these needs. GIVIT’s virtual warehouse removes the need for front-line services to physically collect, sort, and store donations. This allows Council and other response agencies to focus on helping the affected community. To make a donation of goods or services that you know are going to be directed to those who need them most during a disaster, or at any time, visit the GIVIT website.